A balanced editorial approach, a highly respected editor, and comprehensive glosses, footnotes, and historical and cultural essays make this the most reader-friendly introduction to Shakespeare available today. The seventh edition of this comprehensive anthology addresses the two key issues confronted by readers approaching Shakespeare today: a lack of knowledge about the historical period and difficulty with the language of Shakespeare's plays. A richly illustrated general introduction offers insight into Shakespeare's England and background on the literary and cultural contexts in which Shakespeare wrote and produced plays. Each play is introduced by a descriptive essay designed to help the reader appreciate the cultural contexts and interpretive issues raised by the play -- without dictating their interpretations. Thoroughly revised and updated notes and glosses provide additional support to understanding the language of Shakespeare's time. 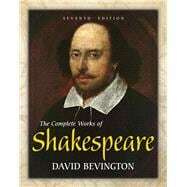 David Bevington is a highly respected editor and Shakespearean scholar. He is Phyllis Fay Horton Distinguished Service Professor Emeritus. He taught drama at the University of Chicago, focusing on Shakespeare and his contemporaries (Jonson, Marlowe, Webster, Middleton, Dekker, etc. ), as well as medieval drama and then the entire sweep of Western drama from Aeschylus and Sophocles down to Caryl Churchill and Tom Stoppard. In addition to courses on Shakespeare, Renaissance drama, and medieval drama, he co-taught in Theater and Performance Studies ((variously with Heidi Coleman, Director of University Theater, John Muse, English Department, and Drew Dir, resident dramaturg at Court Theatre) a two-quarter sequence called The History and Theory of Drama from the 5th century B.C. down to the present day. "One of the most learned and devoted of Shakespeareans," so called by Harold Bloom, he specializes in British drama of the Renaissance, and has edited and introduced the complete works of William Shakespeare in both the 29-volume, Bantam Classics paperback editions and the single-volume Longman edition. He also edits the Norton Anthology of Renaissance Drama and an important anthology of Medieval English Drama. Bevington's editorial scholarship is so extensive that Richard Strier, an early modern colleague at the University of Chicago, was moved to comment: "Every time I turn around, he has edited a new Renaissance text. Bevington has endless energy for editorial projects." In addition to his work as an editor, he has published studies of Shakespeare, Christopher Marlowe, and the Stuart Court Masque, among others, though it is for his work as an editor that he is primarily known. Shakespeare's World: A Visual Portfolio. London Theaters and Dramatic Companies. The Two Gentlemen of Verona. Twelfth Night; or, What You Will. The Second Part of King Henry the Sixth. The Third Part of King Henry the Sixth. The Life and Death of King John. The Second Part of King Henry the Fourth. The Life of King Henry the Fifth. The Famous History of the Life of King Henry the Eighth. Appendix 1: Canon, Dates, and Early Texts. Appendix 3: Shakespeare in Performance (co-authored with Lois Potter). The Royal Genealogy of England. Bibliography: Suggestions for Reading and Research. Glossary: Shakespearean Words and Meanings of Frequent Occurrence.